Dr. Montgomery was among the first Gynecologists at our center to become trained and credentialed to perform DaVinci Robotic Hysterectomies and other Robotic procedures. Such as Robotic Myomectomy (Laparocopic Removal of Fibroid Tumors). Robotic Surgery allows Dr. Montgomery to perform some hysterectomies and myomectomies using small laparoscopic incisions, that might otherwise require an "open" operation. A much faster recovery time. 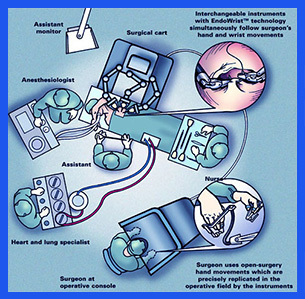 Robotics allow for very precise removal of tissues laparoscopically thus reducing the risk of certain complications. For more information about Robotic Hysterectomy visit the the DaVinci Robot website.